It's interesting how popular recipes travel. 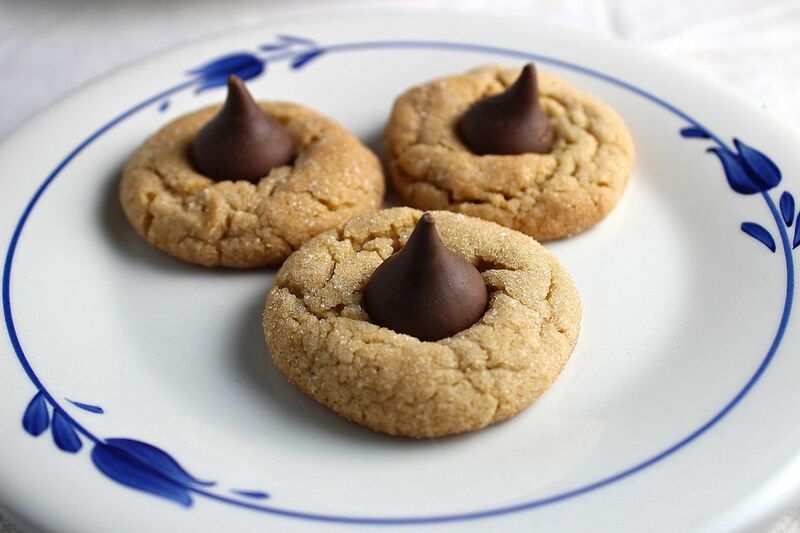 A variation of these cookies was originally a Pillsbury Bake-Off Winner in the 1960s, but I have seen the recipe in cookbooks from Hershey's to Betty Crocker to church books. Try reducing the flour so the cookies are more tender. A chilling step makes the cookies soft, too, and compensates for less flour. Did you know that Hershey's now sells unwrapped kisses packaged for baking, so you don't have to unwrap all the little chocolates? 1. Remove wrappers from chocolate. 2. Beat butter and peanut butter in large bowl until well blended. Add 1/3 cup sugar and brown ​​sugar; beat until light and fluffy. 3. Add egg, milk and vanilla; beat well. 4. Stir together flour (be SURE to measure the flour correctly), baking soda and salt; gradually beat into peanut butter mixture. Cover tightly and chill for 4-8 hours in the fridge. 6. Shape dough into 1-inch balls. Roll in granulated sugar; place on ungreased cookie sheet. 7. Bake 8 to 10 minutes or until lightly browned. Immediately press a chocolate piece into center of each cookie; cookie will crack slightly around edges. Let stand on cookie sheets for 3-4 minutes, then remove from cookie sheet to wire rack. Cool completely. 8. To freeze, shape dough into balls but do not roll in sugar. Place on waxed paper lined cookie sheets and freeze until firm. Pack into hard-sided freezer containers; label, and freeze up to 3 months. To bake, roll frozen dough into sugar, then bake as directed, adding 3-6 minutes to the baking time. Note: the proportions and amounts of ingredients in this recipe are correct. Remember, tsp. stands for teaspoon, NOT tablespoon. That means a measuring teaspoon, not a coffee spoon, or a soup spoon.